Two of the company's most exciting rides to appear in Gameloft's speedy racer. Not to be outdone by the upcoming Real Racing 3, Gameloft announced a new update for the iOS and Android hit, Asphalt 7: Heat, complete with star power from Hyundai. Both parties teamed up to put Hyundai's Veloster Turbo and Genesis Coupe into the game, joining the already impressive list of vehicles. 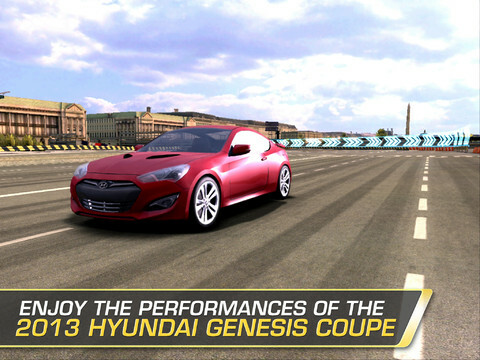 In addition, Android users will receive an exclusive port of Gameloft's GT Racing: Motor Academy, which includes the i-oniq concept car, as well as the Genesis Coupe. "We hope this project with Gameloft will give the young generation, as well as Hyundai's current customers, an opportunity to experience the Hyundai brand," said Wonhong Cho, Chief Marketing Officer for Hyundai Motor. "Hyundai will continue to offer 'Modern Premium' values to future customers through brilliant marketing activities." "We are thrilled to be partnering with Hyundai to offer our fans, and those of the iconic brand, an even bigger selection of vehicles in our already rich catalog of 60 available cars for Asphalt 7: Heat and to let players drive the famous i-oniq concept car in GT Racing: Motor Academy," said Alexandre Tan, Business Development Director at Gameloft. On that note, the update will debut on iOS today, and Android later this month.